It’s a summer day on the eastern shores of Lake Ontario. As a visitor walks down the beach they observe the sparkling of the water, the crashing of the waves, and the laughter of people as they enjoy the beach. Parallel to the water runs a series of fencing and signs that mark the perimeter of the remarkable dune ecosystem that lies just behind. This seventeen mile stretch of Lake Ontario is home to the most expansive dune ecosystem in the state of New York. The dunes are large sand hills that are held together by extensive plant root systems. 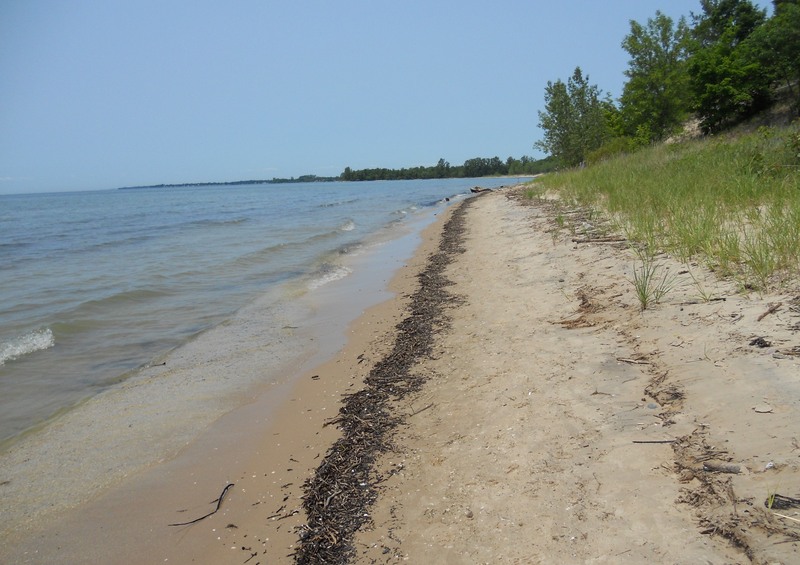 They not only serve as habitat for a variety of species, but as a vital buffer between the power of Lake Ontario and the intricate system of ponds, marshes, and waterways that reside on the other side of the dunes. The Dune Steward Program was established in the mid 1990’s to help protect this fragile dune system by maintaining the fencing and signs, removing litter, working with wildlife biologists and technicians on a variety of projects, and most importantly interacting and educating the public on the importance of the dunes. The stewards patrol the 17 mile stretch of coastline that includes El Dorado Nature Preserve, Black Pond Wildlife Management Area (WMA), Lakeview WMA, Sandy Pond Beach, Southwick Beach State Park, and Deer Creek WMA. Every summer the Department of Environmental Conservation (DEC) in conjunction with New York State Office of Parks, Recreation and Historic Preservation, The Nature Conservancy, and The Student Conservation Association (SCA), places three interns from across the country to work as dune stewards. Dune stewards are current students or recent graduates who have a background in environmental conservation. Beach and dunes at Black Pond WMA. Photo by Jennifer Brady. Along with the duties described above, this program allows the stewards the opportunity to be involved in other conservation efforts. Some of these projects include placing identification bands on birds, identifying and monitoring invasive and endangered species, bird surveys, educational events, and a variety of environmental training opportunities. This year the stewards were able to assist in the successful protection of the piping plover, a federally threatened shorebird species. This small bird lays its eggs in shallow scrapes on grassless beaches or dredged soil areas. This summer was the first time in over 30 years that the piping plover has nested on Lake Ontario. Stewards talked to visitors about the plovers and what they can do to assist in the protection of the bird and its chicks. They advised that visitors maintain a respectful distance and keep dogs on a leash when walking through areas where the plovers were nesting. An adult piping plover and its day old chick. Photo by Elizabeth Truskowski, DEC.
One of the most important aspects of this program was public interaction and education. Each day visitors see the work that the stewards are doing and often approach the stewards to ask questions, express concerns, or even just to thank them for the work they are doing. “It is extremely rewarding to be able to share what we know about the dune environment and its inhabitants to hopefully be able to protect this area for the considerable future,” said Jennifer Brady, DEC dune steward. Post by Jennifer Brady, DEC Dune Steward, Student Conservation Association (SCA). 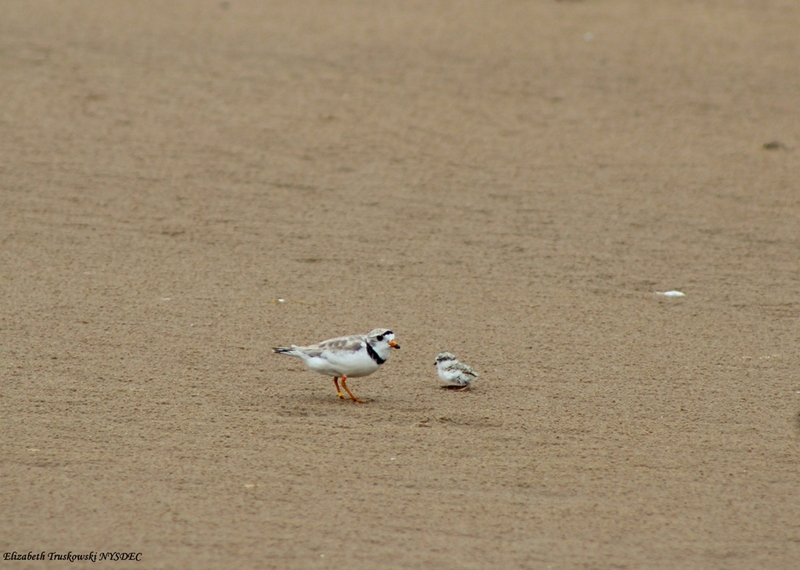 For the first time in decades, a pair of piping plover successfully nested at Sandy Island Beach State Park. 2018 piping plover chick on the beach at Sandy Island Beach State Park.